Welcome! My name is Lisa Merrill and I have been in the business of making "Live Show Quality" model horse tack since 2007. 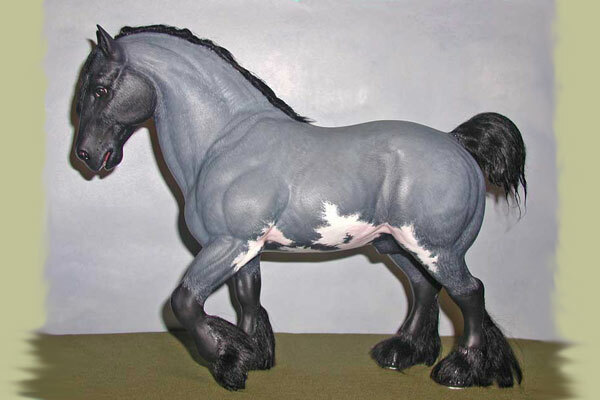 I also provide customizing services on model horse, including resculpting and re-positioning, paint and prep, as well as hairing (replacing the plastic mane and tail with natural mohair.) 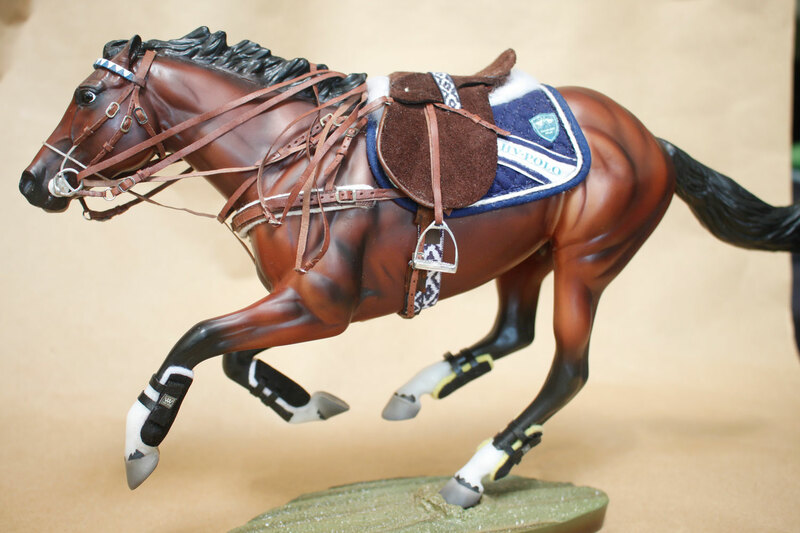 Please note that the tack items offered here under "Model Horse Tack" are for model horses (plastic and resin) in 1:9 -"Traditional" and 1:12 -"Classic" scale miniature. Although I do make and repair tack for real live horses, it will be offered on a separate page and will say so specifically. 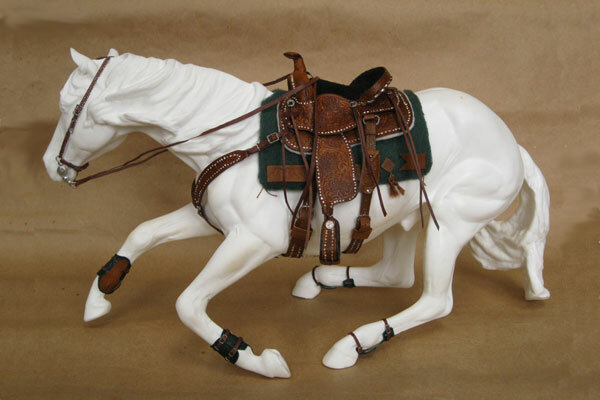 Items listed under "Tack" are intended for use on Model Horses - this means toy horses made of plastic - not real live horses. Items intended for real live horses, and real live people, will be listed on the "Leatherwork" page. Items listed here are custom made to order, per customer specifications. I usually do not have them in stock. Your paid order initiates a work order which will be completed in the order in which it was received. You will be sent an acknowledgement via e-mail with an estimate of completion time. You may send an e-mail in advance requesting a completion estimate if you need one. Let me know if you need the tack for a specific show date and I will do my best to make sure you have it by then. Occasionally I do offer already made tack sets or items, and those items will be clearly labeled as "in stock" or "available for immediate shipment". Please be sure to select all appropriate options that you want from the pull down menus and remember to fill in the text fields for mold name (FAS, Salinero, or CM FAS), or model name (Faith, Prince, Azhar, etc. ), color, etc. You must be specific, when ordering custom tack for your horse, or it may not fit. Please do not type generalities like "traditional breyer" or "traditional resin" when I ask you to fill in "sized to fit this model". I am asking you to provide a specific horse you wish to fit the tack to. While it may fit a few others of similar size, it will fit the model you specify correctly. 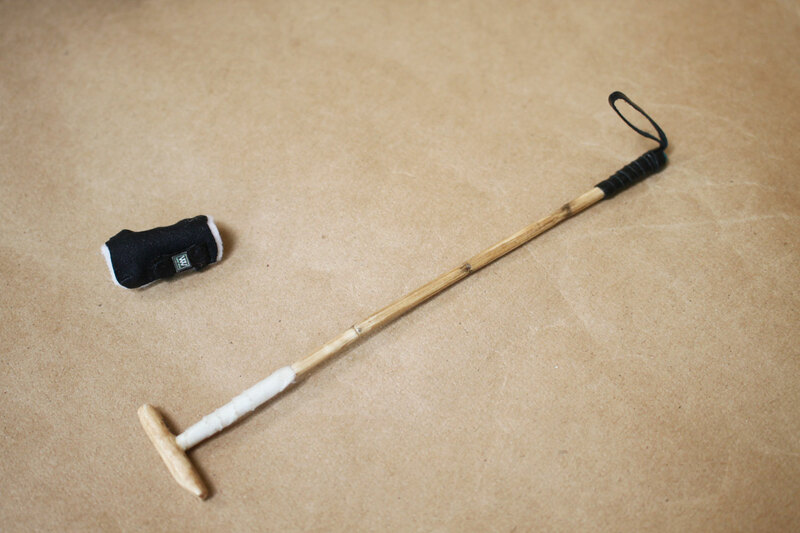 There is less lee way with English tack than with western tack in regards to correct fit, because English tack usually has a browband and throat latch. 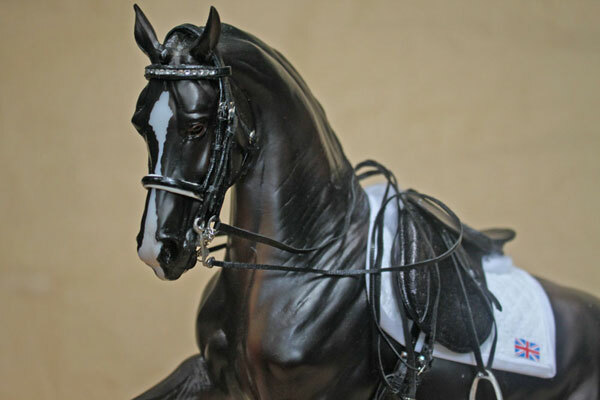 Model horses have molded plastic manes and forelocks that can interfere with tack fit, and plastic horse's ears do not move, so model tack is more difficult to fit correctly than real horse tack. 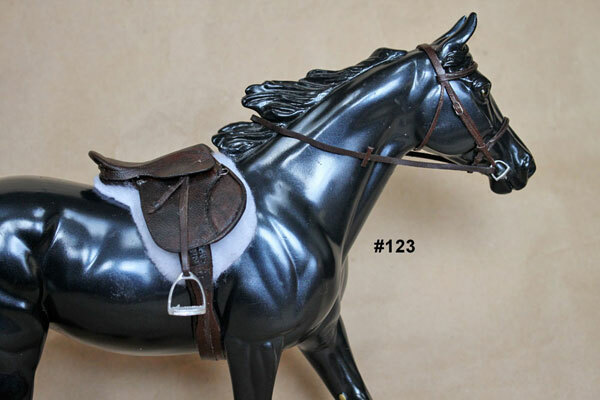 There are several "tricks" I can use to make your tack look realistic in spite of molded plastic obstacles, but I need to know the horse model that will be expected to wear the tack in order to achieve correct fit. That is why it is important for you to tell me when placing your order. You will be able to add any comments you may need during checkout. Security: I do not collect or store your payment information. The shopping cart is handled by PayPal, and so is secure. Your browser may tell you "this site is not secure", and warn you not to input any sensitive information, which is true. I will not ask you for any sensitive or personal information on my website. When placing your order, all of your information will be collected by Paypal's secure server, and your order will be placed using Paypal's shopping cart. (Not this site.) You will be automatically re-directed to the secure site as you shop. I have not purchased the popular "Secure Socet Layer" for my website, because it is not necessary, as I do not personally collect or store any of your information on my site. It's all done through Paypal, which has way more awesome security than I can possibly afford, LOL. Your order is also covered by Paypal's buyer protection policy, (just like an eBay purchase). Shipping: Shipping charges are calculated automatically during checkout, by Paypal. You may find out what your shipping charges will be by using the shipping calculator located at the top of the checkout page. If it looks like it may not be correct, and you don't want to pay it as is, you may also cancel your order through paypal before paying, and place your order via email, where I will personally calculate your exact shipping costs and send you a corrected invoice, which you can pay directly, through paypal. So far, Paypal's shipping calculator has a tendency to overcharge for shipping if your order includes many small items. I usually ship in a USPS Priority mail small flat rate box, so if it will fit, it's all the same price. If you are overcharged, I will gladly refund you the amount. If you are not shipping to the United States, it's a good idea to send me an e-mail request for a shipping quote before you place your order. Shipping calculations are the only weakness I have discovered with the Paypal system, choices are very limited, so I've done my best to compensate. Your order is not considered placed until it is paid. Other customers who may place paid orders before you pay for yours, will be handled before yours. You may request a processing time estimate via e-mail prior to placing your order, if you wish. If you have a show on a specific date and wish for rush processing, you may request it via e-mail. If I have to work overtime to get it out before other orders, there may be a rush processing fee which can be discussed at time order is placed, usually between $10-$30, depending upon the situation. If I can get your order out in time without working overtime, or bumping another person's order, I will do so without any added fee. Check out my new Polo page!